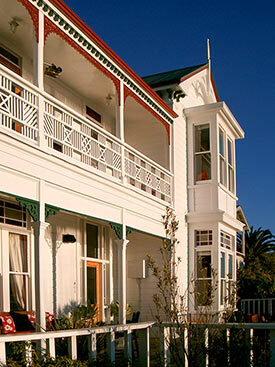 Wakefield Quay House is a heritage 1905 villa offering relaxed luxurious guest house accommodation. We are a seafront property overlooking Tasman Bay and the harbour entrance in New Zealand’s beautiful Nelson. This is the spot to kick off your shoes, socialise with interesting locals and guests and take a break. The Nelson Harbour is a hive of activity with big ships, tugs, yachts and fishing boats on the move, it is a busy and bustling place with incredible panoramic sea to mountain views – Haulashore Island, Boulder Bank with historic lighthouse, across Tasman Bay to the Abel Tasman National Park, and the superb sunsets! Around sunset each evening join your relaxed host Woodi and friends on the deck for complimentary drinks. Chat about your trip plans and get the low-down on Nelson’s fun things to do. Leave the car at home, dinner is a very short stroll to the waterfront restaurants - Boat Shed, Harbour Light Bistro, Styx and Nahm. Or take a 25 minute walk, or a 5 minute drive, into Nelson City to our favourite restaurants Hopgoods & Co, Urban Oyster Bar & Eatery or Parts & Service. Our 1905 colonial villa has all the goodies: 180 degree seaviews from the two luxurious ensuite guestrooms, a fun mix of New Zealand and English antiques, artworks and sculptures from the Nelson region, original rimu staircase, high ceilings, cozy woodburner, air conditioning, native timber floors and loads of Persian carpets. Income from guests ensures the ongoing maintenance of the property. The house may be old but it is no museum, we don't offer bumpy old chairs or flowery wallpaper! We have a two night minimum stay year round in our bed & breakfast to ensure the best service and hospitality. Rates include complimentary happy hour, cooked breakfast and high speed WiFi. Thank you for taking the term 'hospitality' to a whole new level - we so enjoyed everything. Incredible views and outrageous people – thanks so very much.